CrossFit takes The Arnold by storm. Sectional Workouts From The Arnold Announced! A look at what's to go down at The Arnold. A breakdown of the schedule from the Ohio sectional. Mix it up with HQ trainer-athletes and see a Games sectional at this year's Arnold Classic. 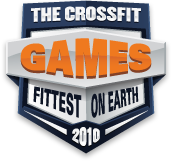 CrossFit Games veteran Josh Everett (3rd in '07, 2nd in '08) will be competing at the OH/IN/KY/MI Sectional as a tune up for the South West Regional competition being held May 8-9 in Southern California.